The first step in setting up a SAML configuration is to be setup a certificate on that will be used to encrypt the identity assertion that GridGuard sends back to the service provider. Administrators can use the same certificate for all service providers, or choose to create separate ones per service provider(s). The choice is entirely up to the administrator. There might be instances where you have some service providers that support only DSA certificates, and others that support only RSA certificates. In those cases, you will need to generate separate certificates for the service providers. The Identity Provider (IdP) Configuration screen is displayed. IdP certificates can be managed on this page. Set the host name to the fully qualified domain name (FQDN) that the service provider will use to refer to the GridGuard server. Typically this will be a value like 'gridguard.company.com'. This host name is used to generate the GridGuard IdP metadata that will be imported into the service provider's site. Note: If GridGuard is configured in a cluster, then the host name should not be set to the name of the node; rather it should be the name of the load balancer. For example, if the nodes in a cluster are named grid1.company.com and grid2.company.com and the load balancer is referred to as gridguard.company.com, then the host name should be set to 'gridguard.company.com'. Set the certificate format. 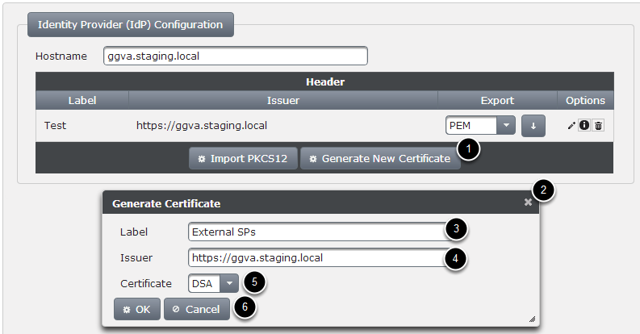 GridGuard supports both DSA and RSA certificate format. Some service providers support only one or the other. Check with the service provider to ensure that the right format of certificate is being used. Certificate details including issuer, validity period, algorithm and fingerprint are shown in the 'Certificate Information' dialog that is displayed.